North Georgia vacation cabin rentals in beautiful Blue Ridge Georgia. We have luxury cabins, affordable cabin, river cabins, private and secluded cabins, lake cabins, and beautiful wooded cabins. Lodge and wedding venues also available for rent. Explore the Appalachian Mountains, waterfalls, shops and restaurants, and many other adventures while staying with Mountain Laurel Cabin Rentals. Tucked away in the Aska Adventure Area this upscale mountainside home has spectacular long range mountain views. Perched on a mountainside “All About The View” is a spectacular upscale home with breath-taking one of a kind mountain views. The amazing mountain vistas are only matched by the newly constructed cabin itself! Make your way to the cabin, driving the windy mountain road along the valley of Weaver Creek where the sounds of the stream and views of the rolling hills welcome you. As you climb in elevation the last mile of your journey is along a gravel, one lane, windy mountain road for a one of a kind mountain experience. Just ahead, you'll make a left into the cabin's split-rail fence driveway and arrive to “All About The View” nestled against the mountainside. 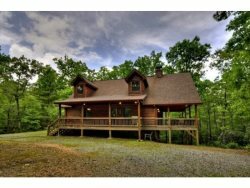 Though the last section of drive is steep, winding and narrow (4WD required), the beautiful one of a kind, cabin is only about 8 miles from downtown Blue Ridge! The soaring ceiling of the main level’s great room, which flows into the gorgeous kitchen and dining space has a wall of windows for a breathtaking view of the mountain range. The dining table seats 6 guests comfortably plus a stone front breakfast bar that seats 4 more guests. Stainless steel appliances and granite counter tops in this beautiful kitchen makes preparing meals so easy. The open floor plan offers the perfect gathering area for the entire family. A massive floor to ceiling stone gas log fireplace with cozy luxurious seating and a large flat screen TV above the fireplace make up the living area. Just off the dining area is a half bath/powder room. The main level deck, accessible from the great room offer’s an outdoor wood burning fireplace, flat screen TV, patio seating, a gas grill, and an outdoor dining table. This is a perfect place to end or begin your day and enjoy the priceless mountain views. Around the corner from the main living area is a king bedroom with spectacular views of the mountain range. A king bed, flat screen TV, and ensuite with a double granite sink and tile shower complete the main floor of the home. Take the reclaimed authentic mountain laurel staircase to the upper level where you will find a standard (tile shower/tub combo with single granite counter top vanity) bathroom and two separate bedrooms. The first bedroom has a custom designed three bunks built into wall, (three twin size beds), open lockers and a flat screen TV. The second bedroom on this level has a king size log bed, flat screen TV and a breathtaking view of the mountain range. If you are ready to play, the lower level/game room/living space with pool table, wet bar, wine chiller/mini fridge, log table with 4 chairs, and a large flat screen TV is the place to be. The 4th bedroom with a king bed featuring a large barn wood style head board and large flat screen TV. The bathroom on this level is accessible from the bedroom and game room/living space. The bathroom has double vanity granite countertops and a tile shower/tub combo. Step out onto the lower level deck which features a Hot Tub and outdoor seating. Soak in the Hot Tub after a day of adventure or sit on the deck and star gaze. This home has mountain views unparalleled to any.